We had planned to swing south to the Great Australian Bight to see the whales ever since we crossed the Nullarbor plain in the summer. Every year thousands of Southern Right whales migrate up from Antarctica to socialize, breed, and give birth in the calm shallow waters off the coast. Named Right because they were the “right” type of whales to hunt, they were threatened with extinction in the previous century, and are gradually coming back from the brink. Leaving their feeding waters in the Antarctic, they travel thousands of miles across the open ocean to get here. Being filter feeders, there is no food for them here, and they will go without food the entire time (about 6 months). We chose to drive to the whale-watching area at Head of Bight, which is on the eastern edge of the Bight. About 150 of the 2,400 Australian Right Whales visit here each year. Pregnant females will give birth in the calm shallow water here, while males compete for the other females' attention. Males are up to 15m (47ft) long and weigh over 50 tons. They wrestle, race, jostle, and breach in regular competitions for the available females. This competition allows the females to select on the healthiest and largest males. Some Southern Right Whale vital specs. It is impressive to see these enormous animals “frolicking” in the waves. We were able to see several females with their newborn calves as well as numerous males in competition. Even at a distance, it is quite impressive when a 50ft long animal jumps nearly out of the water. Here are some males racing each other. They will attempt to hold each other underwater, and use various other tactics to delay their opponent. This location has several large viewing platforms. There were around 15 whales in view while we visited. Here is a cow and her calf. The calf may look small, bit it already weighs as much as a small car! The mothers gently swim in the calmer water near shore for several months while they nurse. When the calf has enough fat and strength to make the journey, they will set off across the ocean for the summer feeding grounds. The coastline here has a rugged beauty. The “while we are here” kept growing, this time to include a revisit to Flinders Ranges so I could see the fossils I missed out on before. We had been told by friends in Victoria that there were loads of fossils in the ranges, and I had forgotten to look for them while we were there before. On the way over there, though, I decided I needed another doctor visit (rash/fungus infection still hadn’t gone away), so I scheduled one in Port Augusta. The online system didn’t end up working, but they were able to get me in anyway. This cost $60AUD and my doctor was a man with a heavy accent, but he prescribed a strong steroid cream. The doctor let me know that this should cure it within one week, but if it didn’t, I would need another doctor visit and some tests. And, that it may be reoccurring, since he is only treating the symptoms with the cream and doesn’t know the cause. Well, hopefully, this one will be effective. Of course, in my mind, when someone says “fossils,” I have delusions of great, complete skeletons, just barely unearthed in stone. For example, as they did in the exhibition in Dinosaur National Monument in Colorado. I loved that place! They have unearthed whole, mostly-intact skeletons there and left them in the ground, so you can see what it is like for an archeologist. That is what I keep hoping for when people tell me I can see fossils. Sadly, the fossils that you can see in Flinders Range National Park are not at all like that. Not to say they aren’t still amazingly awesome, but that they weren’t for what I was hoping. Instead, you drive down Brachina Gorge Road and are introduced to the layers of rock formed millions of years ago. So long ago, in fact, that most of the vertebrate species of “dinosaurs” weren’t around yet. The life that was captured in those old rocks were very old forms of life. For example, the sponge-like archeocyaths that lived in warm shallow seas. So the fossils are more just impressions in the limestone that was lying around. Jonathan was really good at spotting them. Me, not so much. The area is beautiful, and we enjoyed our fossicking. We even went for a stroll along the Trezona Hike. Along this hike is the “golden spike”, a point that marks the beginning of the Ediacaran Period, which marks the oldest evidence of animal life on Earth. This period was the first new geologic period to be defined in 120 years (and the only one based upon rocks found in the southern hemisphere). Quite the find! You can see the boring holes they used to obtain core samples above the golden spike marker. Remember the living stromatolites we found in Western Australia? These are fossilized ones! We met some emus along the way. Ringneck parrot in the trees. You see the two tall peaks there in the middle? We hiked to the saddle between them three months prior (Apr-15-2017). Finished with the park, the next day, we decided to visit some nearby gorges and hit up a restaurant that served bush food. Wanting to try some exotic meat that I normally wouldn’t get, we ate the Feral Mixed Grill special at the Prairie Hotel. The flavors/textures were interesting. Not something I would probably get all the time, but not something I would be disgusted by eating. The kangaroo had the best texture, but was kinda bland. The rest had good flavor, but poor texture. 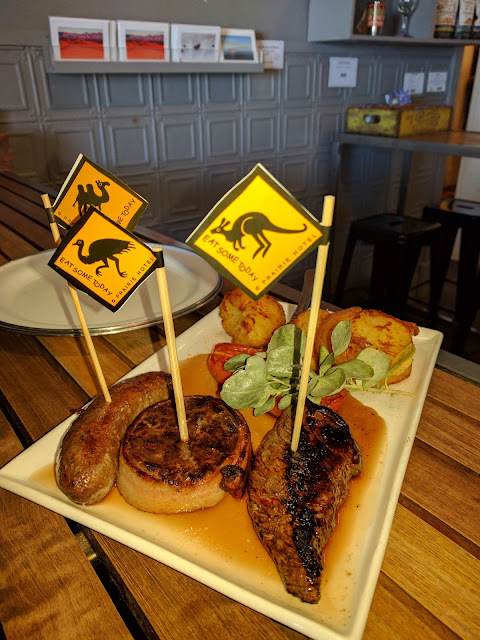 As the image suggests, we ate camel sausage, emu mignon, and kangaroo filet. After that we said goodbye again to the Flinders Ranges. The Flinders Ranges used to be (millions of years ago) massive mountains. But erosion has worn down the peaks so that all that remains are the edges of the bases. In the panorama below, you can see how the hills on the left have layers going diagonally from the bottom left to the top middle. The hill layers on the right are a mirror image (bottom right to the top middle). That would have been one massive mountain in between them. We were now at a crossroads. We knew we wanted to head north to be in Cape York before October, but, unbeknownst to our family, we were planning a trip back to the USA to see the eclipse! However, that had some complications because we had to figure out the best way to get to Sydney, and find a place to safely stow our van. After weighing our options (Cairns, Brisbane, Sydney, Melbourne, and even other regional airports), we decided on either Cairns or Melbourne, as they were the cheapest. That made it easiest to choose Melbourne, as Jonathan wanted to scope out some 4x4 Sprinter vans, and we had a contact in Melbourne who had a bunch. That made it our last item on our “while we are this far…” agenda. And we started on our way east to Melbourne. As a special treat, the town from which we exited South Australia housed a wildlife park that had white Western Grey Kangaroos (apparently this white gene is dominant)! “I think it is just the shower curtain settling. You did move it,” says I.
I turn on the light to watch the shower curtain. No movement… “Why don’t you turn off the vent fan so we can hear better?” Jonathan says in his troubleshooting voice. After the fan is off, we hear it again, but this time, we identify it by Jonathan’s head in the D pillar. There shouldn’t be anything in the D pillar, except foam and wires… Jonathan taps on the pillar and hears a squeak. This initiated a conversation on how to handle the situation. Jonathan, convinced that the mouse had no other outlets, decided to tape over the holes we saw and force the mouse out back the way he came. Deciding this was a good option and more likely successful than trying to force him out of the hole and end up in the van, he taped up the holes while I stayed tucked in the warm bed, occasionally offering a hand to hold a light. Then, he came back inside, got back into bed, and settled in for the night. As soon as the lights were out, the mouse started his rustling again. It went quiet shortly, but we realized it would probably be a long night. Then, we heard some bags crinkling. With no progress after a while and hearing him under the bed, we decide to lift up the bed (which means I have to get out). We wait in this position for a while, but as I was unable to stay awake much longer, I ask what the worse-case scenario is if we left this until the morning. Worst-case is he eats through our wiring, which isn’t very likely. Most likely scenario is that eats our food that isn’t in hard-plastic containers (granola bars, nuts, etc.). So, I suggest we set a trap (the container he originally went into, but emptied and some chips and nuts in the bottom) while I put away as much of the food as I can think of when that sleep-deprived. After what felt like 10 minutes after getting into bed, I hear “He’s in the container!” Jonathan turns on the light to peak. Groggy and unconvinced, I don’t even look. Sure enough, he wasn’t. I told him, “I hear a bag crinkling, that isn’t the container.” Then we realize we didn’t block off the vertical cabinet, so Jonathan closes the doors to that. Perhaps it will lock him in there and we try sleeping some more. But, of course, by this point, the rain or fog had come in, which had caused the tree above us to drop droplets of water on us in interesting patterns, which very much made it sound like little feet pattering across our roof. I tried to tell Jonathan it was just the rain, but he wasn’t so convinced. Let’s just say that we didn’t have a very restful sleep. This occurred in the middle of what was an otherwise mostly-uneventful trip to the Little Desert National Park in Victoria. I was excited by the name (which by the way is not too far from Big Desert NP), and knew nothing about it. As we approached from South Australia, we thought it odd that an area this green would have a desert 15 km south of where we were driving. Sure enough, the “Little Desert” seems mostly to be named because of the sandy “soil” there, not because it is arid. However, it was an interesting little park with several walks and a bunch of wildflowers. Sandy, but not very “desert”-like. More of these mini (1-cm wide) carnivorous flowers. Mallee Fowl Mound. These amazing creatures use decomposition to thermally regulate their eggs (instead of sitting on them). The mounds are huge. Sadly, they are in danger of becoming extinct. For one, the whales were not very predictable. When they would decide to start and stop their antics was not readily noticeable. The whales, while close to the shore, were still pretty far for a camera. So, zooming in was necessary, and I would often loose my place in that vast ocean. My camera’s autofocusing was really struggling between the lens scratch and the waves. The wind was crazy strong and kept buffeting us. Eventually, I decided the best way to capture the moment was to video the scenes. However, I still wasn’t very good at this, but at least I caught a few of the interesting antics on camera. I must say, I was like a kid in a toy store. I really enjoyed the outing. Right when we first saw them, the whales starting in on these beautiful antics that almost seemed choreographed, as they would often wave at each from distances of several hundreds of meters across murky, wave-tossed ocean. Not sure how they coordinated this. Really, I would recommend this event for everyone. It was really cool. First half = mother and baby; 2nd half = 2 males arguing over a female. Fin waving and a whale rolled completely upside down. As we drove east from Flinders Ranges towards Melbourne, we decided to take a more northerly route through the Grampians National Park. A modest collection of mountains, this range (like most of southern Victoria) is quite wet in the winter. We had most of the park to ourselves, as the “cold” weather deterred all but the most intrepid visitors. Victoria is pretty sign and safety crazy. Lots of water-carved canyons/gorges to explore. All of it nice and cool with daytime temps less than 60F. Notice anyone familiar in this photo? At least with all the rain we got a few rainbows. We have found memories of chasing what we thought were mice, but likely to be amorous Antechinus, around in our van. That is hilarious! The male antechinus apparently will often die after mating season. The stress kills them! I have since glued aluminum mesh over just about any mouse sized hole I can find under the van. Time will tell. After a short trip back to the USA to view the Solar Eclipse, we took a week to do maintenance and repairs on the van. Finally, with our van serviced and our storage spaces overflowing, we were ready to hit the road again. The goal was to get back north again and carry off where we left off after Alice Springs to complete our clockwise circuit of the country. Since there isn’t much between Alice Springs in NT and Mount Isa in QLD, we decided to head pretty much north to Mount Isa via various inland routes, knocking off most of the rest of the outback items along the way. Therefore, we left Melbourne to head for Broken Hill, NSW. Of course, if you know me, we wouldn’t be making a beeline straight there, we would wander around and see some sights along the way. A family of kookaburras kept us company while we were working on the van. First off was the Daffodil Festival in Kyneton! There weren’t actually that many activities involving daffodils, sadly, but they did have a long row of them at the entrance to town. And, they had ferret races! As we drove further north, I discovered a new favorite industrial cash crop: canola! The fields of flowers are gorgeous! Since we visited Little Desert National Park, I only thought it appropriate to visit Big Desert (Wyperfeld National Park) as well. A mob of Western Red Kangaroos. Shingleback Lizard. He was a chunky guy with an attitude. He stuck out his blue tongue at us as we came close (too slow with the camera). From another angle. He had been chilling on the road (perhaps trying to get thinner?). Snowdrift Dune. A large non-stabilized dune with nearly snow-white sand. From there, it was a visit to the Pink Lakes in Murray-Sunset National Park. These lakes are, of course, salt lakes. Rather than being pink from pink salt, though; it is the result of an algae. It had been raining recently, which meant plenty of nourishment for the algae, and thus plenty of pink. The salt in these lakes is 99% pure, which meant it used to be mined. Apparently the conditions were pretty terrible, though, as they had to do it when the lake was dry in the extreme summer heat. Then to Hattah-Kulkyne National Park before finally exiting Victoria for the third time. This park is home to several wetlands along the Murray River. Crossing the Murray River into New South Wales. On our drive north from Victoria we took a meandering route through the center of New South Wales (NSW). Referred to as NSW’s outback, this arid region will probably remind you of NT and WA. Our first major stop was Mungo NP. This park, once a large pastoral lease, is now a NP due to its unique archeological significance. The park centers on a now-dry lakebed surrounded on the east by tall multilayered dunes. In the photo below, you see the expanse of the lakebed, and the dunes on the far side. What makes this park unique is the archeological finds in the dunes themselves. This area has been occupied by aboriginal peoples for over 40,000 years. The dunes build and erode at very predictable rates based on whether the lake is dry or not. This has allowed very precise dating of the various remains found here. Everything from bones to ancient fire pits. Despite getting less than 12” or rain a year, there is plenty of life here. A hawk sitting on the highest thing for miles. When the vegetation is disturbed, erosion begins. Here you can see the alternating sand and silt layers that were deposited over the last 100 thousand years during alternating wet and dry periods. A red kangaroo doing what they do best. Even in the desert, there is water if you know where to look. At this soak, water in the dunes pools just below the sand. Animals come from miles around during the dry to get a drink. Here you can see a flock of emus digging holes and getting a drink. When rain does fall, grasses and wildflowers spring up from the seemingly barren earth. Continuing on, we visited Broken Hill and the hilltop sculpture installation west of town. We got to watch the sun set from the edge of nowhere. Flat enough that you can see the curvature of the earth almost. This is mining country, and the next town, Cobar, is no exception. You can see a pickup truck at the bottom, it pretty small at this distance. We rounded outback NSW off with some ancient rock art in Gundabooka NP. After our excursion through outback NSW, we entered Queensland (QLD). This is our last new-to-us state in our Australian journey. We have officially been in every state in Australia now! The plan was to travel north and west up to Mount Isa and then swing back east to Cairns. From Cairns, we would begin our final southward journey back to Melbourne via the notorious East Coast of Australia. Like the rest of Australia, Outback QLD consists of long stretches of flat, arid country, interspersed with small towns with random knick-knacks and claims to fame. Statue of “The Cunnamulla Fella” in the town of Cunnamulla. In 2014, a truck carrying anhydrous ammonia caught fire and then exploded, wiping out the bridge for cars and the nearby railway. We had been in a town further south and thought the railway only looked recently abandoned (only long enough for a small sapling to take root. Now we knew why. You remember back in school when they told you about people trying to make it rain by sending stuff up into the sky? A scientist actually did the experiment in Charleville to endeavor to end the drought! Of course, it didn’t work, but it was interesting to see these Stiger Vortex Cannons on display there in the middle of their disc-golf course. 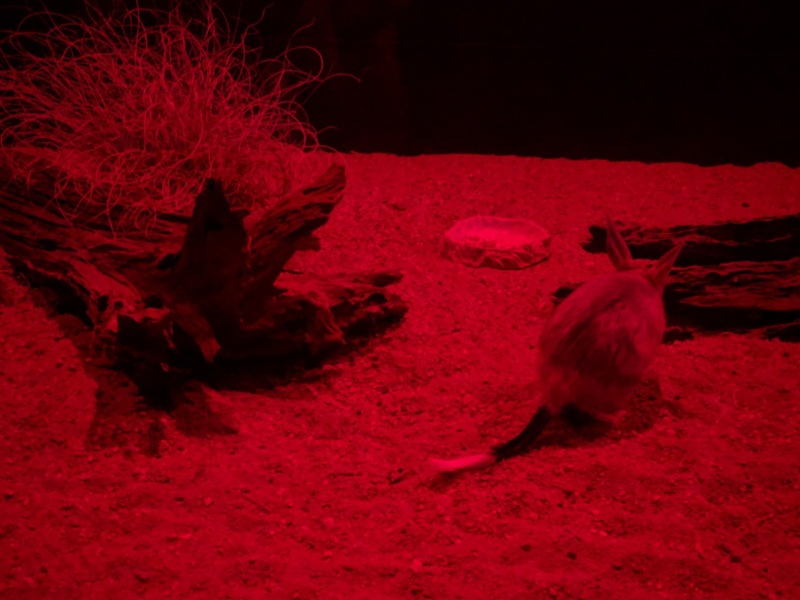 They also had a Bilby conservation center there. We arrived on National Bilby Day and got to see them in the dark room! They are interesting creatures. 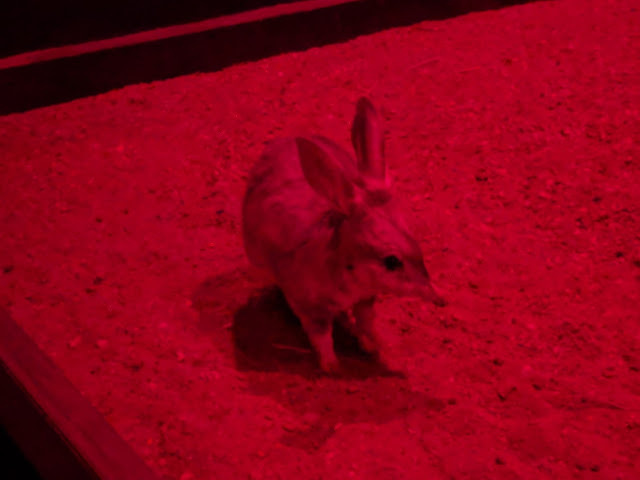 Kinda the marsupial version of the rabbit. But they are greatly endangered, with only about 400-600 left in small pockets in the wild. Barcaldine was the headquarters of the major sheepshearers’ strike in 1891, where meetings were conducted under the tree of knowledge. In 2006, the ancient tree was poisoned and died. Instead, they now have a unique memorial around it. The empty space around the tree represents where its canopy used to be in its glory days. In Winton, there was a research museum called Australian Age of Dinosaurs with sauropod fossils. They were massive! For those Despicable Me! fans out there! On the fifth day after entering QLD, we finally arrived in Mount Isa, in time to restock before we continued on. The smoke stacks from their mining operations are huge!